Future First has been on the road. Our recent Back to School Weeks in Birmingham and the South West celebrated the inspiring role models that go back and give back every day. 28 alumni events took place across two weeks and over 3000 students took part. National treasure, Julie Walters, joined over 200 alumni in showing support for the campaign. March began with Back to School Week South West. From apprentices, CEOs, and engineers to business owners, financial advisers and farmers, the week saw 36 alumni go back, give back in 26 events across Cornwall, Devon and Somerset. Every former student had a unique story to tell. Claire Stocker left Penair School, Cornwall, in 1985 and has been a nurse for 20 years. She told students she had good memories of the school but she didn’t always fit in… “I want to reassure students that there is a future after school. I was diagnosed with dyslexia and I found lessons difficult. I’ve had to find a way to communicate well through my job as a nurse.” Claire told students to pursue interests outside of their career, having written several books including ‘The History of Truro’ herself. 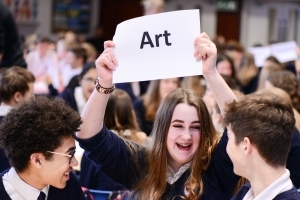 At Chilton Trinity School in Somerset, trainee GP, Claire Macadeem, told students to find a job that makes them happy and not to worry if they change their mind about future plans. At Churston Ferrers School, Police Community Support Officer, Beccy Pearce, told students to keep asking questions: “take advice, ask for advice, and use it to make your own decisions”. The following week, we headed to the Midlands for Back to School Week Birmingham. 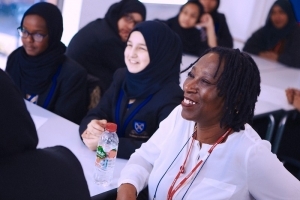 Backed by national treasure, Julie Walters, we visited schools across Birmingham showcasing the incredible ways in which alumni are inspiring and motivating today’s students. An eclectic range of alumni, from forensic scientists and family support workers to CEOs and undergraduate students, headed back to their old schools to take part in the event. The alumni stories from Birmingham were no less inspiring than those in the South West. At Kings Norton Girls’ School Suzanne Swingler told students that she had qualified as a nurse despite being diagnosed with dyslexia after leaving school. Samantha Peckham became a mum at 16 and now sits on the Women in Transport Board. After going back to speak to students at her old school she told her story on BBC Radio West Midlands, News Now, Europe Breaking News, Pressreader.com and in local press, including The Birmingham Press. At Holyhead School, Abdul Sohal, who works in IT at Land Rover, told students: “my job hadn’t even been invented when I was at school.” Students heard how his success has been driven by strong communication skills and the ability to build a strong rapport with people from all walks of life. Next up is Back to School Week Norfolk, 2-7 July– we’re excited to share inspiring stories from the region in the summer.